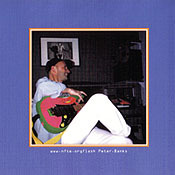 All songs written by Peter Banks. If you’re expecting to hear a reproduction of Instinct on Reduction, you’ll have to settle instead for less. Peter Banks falls prey to the allure of gizmos, drowning out his own guitar work with drumbox beats and synthetic basslines. If the spoken snippets suggest Robert Fripp circa Exposure, the guitar distortion and aimless arrangements point squarely to Adrian Belew’s Desire Caught By the Tail (and you don’t want to be pointing at that). Like Belew’s failed first instrumental album, Reduction finds the guitarist sleepwalking through various settings, some languorous and others lively, trotting out the same by-now familiar sounds once too often. Banks doesn’t need to look beyond his guitar for inspiration; when he unplugs the drumbox for “Fade to Blue” and “Consolation in Isolation,” listeners are able to cut through the distractions and get to the core of Banks’ appeal. More than one good guitarist has been mesmerized by mechanical add-ons, as if audiences expect the guitarist to carry the weight of an entire album. And yet it’s fair to assume that most people who bought Reduction were hoping to hear Banks play his guitar, not diddle around with drum machines and club beats. Maybe one or two examples of aggressive rock would have been interesting for a change of pace (“Dirty Little Secret” does it very well), but Peter Banks would do better to stick to quieter, self-standing compositions. Songwriting has never been his strength — technique has. Better to put the toys away and let his original talents rise to the surface.